Could New York City's famed Oyster Bar be the Taggart cafeteria? Is 120 Wall Street the Dana Building? Meet the man with the map of Ayn Rand's New York. Fred Cookinham's mastery of historical detail provides a fascinating voyage through the imagination of Ayn Rand. His walking tours of Manhattan enable one to literally retrace Rand's footsteps and discover the locations she used as a source of inspiration in her novels. In this interview with Jennifer Iannolo, Cookinham gives Atlasphere readers a sneak preview of the details, and reveals plans for his upcoming book, The Age of Rand. The Atlasphere: How did you become familiar with the works of Ayn Rand? Fred Cookinham: When I was 11 years old I found Anthem and Atlas Shrugged sitting on my brother’s bookcase. I started reading and never stopped. TA: What prompted you to begin gathering facts about her? Cookinham: In the course of learning about her ideas, I met people who had a great deal of knowledge about Rand and her work — personal acquaintances, students of Objectivism, and fans of her literature. What interests me most is the process by which ideas percolate through culture. How are ideas spread, and at what levels do they permeate a culture? Rand’s novels were initially advertised more by word of mouth than by the ad budget of her publishers. Grasping and responding to Rand is a personal experience, not a bandwagon movement. She touches something deep inside certain individuals, and they spread the word. TA: How did the concept of the Ayn Rand walking tours come about? Cookinham: I had been conducting Revolutionary War tours, and in 1998 a friend suggested that I create an Ayn Rand tour. I originally thought of doing this in 1983, when the Libertarian Party had its convention in New York City, but unfortunately the idea came to me during the convention, so it was too late to get it rolling at that time. So when my friend made the suggestion in 1998, I decided that New York City would be a natural place for the tours since it was such a prominent feature in her novels. She was very much inspired by the architecture of the 1930s and 1940s (the Art Deco period). Since there was so much to see and explain, I eventually had to split it into five separate tours. I’ve now cut it back to four and a half. TA: What are the different tours? Cookinham: The tours are Skyscrapers of the Fountainhead, Ayn Rand on Broadway, Ayn Rand’s Fifth Avenue, and Ayn Rand’s Park Avenue. 120 Wall Street, or the Dana Building? Skyscrapers of the Fountainhead takes place in downtown Manhattan, where I take people around to the different buildings that may have influenced Rand’s research for the book, such as the 1907 Customs House by Cass Gilbert. It is a good Beaux Arts building, but covered with excessive ornamentation, or “froufrou,” as I call it. 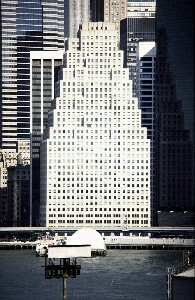 120 Wall Street, by Ely Jacques Kahn, may be what Rand had in mind for Henry Cameron’s Dana Building, with its clean, uncluttered look. The other tours take place in midtown. Ayn Rand on Broadway is a tour of the theatres where her plays were produced, and also spotlights the places where she interacted with Lillian Hellmann and Cecil B. DeMille. Ayn Rand’s Fifth Avenue includes some other buildings by Ely Jacques Kahn, as well as Rockefeller Center. In addition, I show where Random House was located in 1957 when Atlas Shrugged was published, including the window where the book was displayed. Ayn Rand’s Park Avenue is a tour of the neighborhoods and buildings where she lived throughout her time in New York, as well as the building where she worked for Ely Jacques Kahn to do research for the Fountainhead. It is one of his best buildings, located at Two Park Avenue, and the location where Rand worked as an unpaid typist and filing clerk for six months to do her research. TA: What other special details can people learn on the Rand tours? Cookinham: There are some interesting locales that may have served as an inspiration for different parts of her novels, particularly for Atlas Shrugged. She spent some time around Grand Central Terminal, and even persuaded the New York Central Railroad to let her ride in their Twentieth Century Limited’s locomotive. They let her drive the train, and she was quite thrilled about it. There is also a scene in Atlas where Dagny rents an office in a dilapidated building across from the Taggart Terminal. I show tour goers the location that Rand may have used, which is a desolate old alley next to Grand Central Terminal. There is also a building that was built to be the headquarters of the New York Central railroad, and I suspect she used this as an inspiration for the headquarters of Taggart Transcontinental. Interestingly, there is a newsstand inside the building that is similar to the one Dagny visits to inquire about the dollar-sign cigarette. Downstairs in Grand Central Terminal, there is a place that may have served as the model for the Taggart workers’ cafeteria — the Oyster Bar, a famous restaurant that includes both a tablecloth side and an actual oyster bar. There was also a cafeteria-style restaurant, Child’s, in the lower level of the Paramount Building in Times Square, where Rand worked as a reader. She may have used that as a model as well. And Alan Greenspan played sax there in a swing band. And, interestingly enough, there was a vacant lot across from one of her residences on Park Avenue that was once used to display model houses. One was a traditional house, built in 1935, and the other was called the House of the Modern Age, built in 1936. I can’t help but to think that these served as an inspiration for both Anthem and the Fountainhead. TA: You mentioned that Ely Jacques Kahn’s building, where Rand did her Fountainhead research, is being given special recognition as a historic site. Could you share the details with us? Cookinham: Kahn had his office there for forty years, and the building is now receiving a plaque from an organization called Friends of Libraries USA, which creates plaques to be placed on buildings of literary historical significance. They called me explaining what they were planning to do, and I made suggestions for the wording, location, and lighting of the plaque. The plaque was to be unveiled around the time of her birthday next month (February 2), but it may be delayed while they get the building owner’s permission. TA: Do you have a special tour planned for Rand's centennial? Cookinham: Yes, I will be hosting a special edition of the Ayn Rand’s Park Avenue tour to celebrate her hundredth birthday, and it will include a stop to view the plaque if it has been placed by then. TA: What is the date and time of the tour? How can people sign up for it? Cookinham: The tour is at 11 A.M. on Saturday, February 5, at the southwest corner of Lexington Ave and 42nd Street. People interested in attending the tour can go to my web site, Century Walking Tours, for details. The tour costs $15.00, and reservations are not required. TA: There is an announcement on your web site that you have a book coming out in 2005 called The Age of Rand. What is the book’s focus? Cookinham: It is a non-fiction book that speculates what the future might be like if Rand’s ideas were to become the majority view worldwide. TA: What inspired you to write it? Cookinham: Five years ago I was reading a book entitled The Age of Attila, and it occurred to me how many books there were containing the word “Age”: The Age of Roosevelt, The Age of Jackson, and of course Thomas Paine’s The Age of Reason. I thought that if Rand’s impact keeps growing at its current pace, someone should write a book about that impact. Then I thought, well, why don’t I write it? TA: What is the book’s time span? Cookinham: It speculates about the period fifty to one hundred years in the future, and has a personal, conversational tone. Though one is not supposed to use word “I” in a non-fiction book, I used it on every page. One reader said it had the flavor of an all-night philosophical conversation, but it should appeal to both philosophy and science-fiction readers. TA: When do you expect to publish The Age of Rand? Cookinham: I had hoped to publish it close to the time of Rand’s hundredth birthday, but it now looks more like early March. Laissez-Faire Books may offer it in their catalog, but that has not yet been confirmed. The book will also be for sale on the internet through iuniverse, Barnes and Noble, and Amazon. And of course, autographed copies will be sold on my Rand Walking Tours. TA: As a Rand historian, how would you best summarize the influence her work has had in the last century? Cookinham: Well, her philosophy is still not on the radar screen of the whole world, but I’m hoping that it will become so. Since we currently live in a world so dominated by religions, one thing that might happen is that the current wave of fundamentalism in Islam, Judaism, Christianity, etc. may create a backlash. People may have enough of fanatical religion, and if that happens, Objectivism, as a secular, scientific philosophy, will be poised to really take off. In the past few years, I have noted that more and more books are being written about Ayn Rand, and the phenomenon is growing. I’ll be interested to see how fast it grows in the next few years. TA: Well, her fans would certainly applaud that. We look forward to seeing whether or not your speculations come to fruition. Fred Cookinham is a legal proofreader, and a tour guide specializing in historic Manhattan spots, including Ayn Rand’s New York and various Revolutionary War sites. For more information about his tours and upcoming book, The Age of Rand, please visit his web site, www.centurywalkingtours.com.